People who make these sorts of comments seem to think that the autistic spectrum measures everyone’s ‘degree of autism’ on a scale from not at all autistic to totally autistic, and so everyone’s somewhere on the spectrum. This is not what ‘autistic spectrum’ is meant to mean. In fact only autistic people are on the autistic spectrum. If you’re ‘on the spectrum’ then you are autistic (or ‘have autism’, whichever is your preference), it is a spectrum of the people who are autistic. Not autistic? Not on the spectrum. We say that autism is a spectrum condition because there’s a huge amount of diversity among people who are autistic, so it’s more helpful to consider autism as a wide range of different experiences rather than taking a single one-size-fits-all approach. The cliche is that when you’ve met one autistic person then you’ve only met one autistic person, and there’s a lot of truth in this. It’s surprisingly easy to find two people who are both autistic but have astoundingly different traits, personalities and communication styles. In fact I’d go as far as to say that you’re more likely to find these extreme differences in a group of autistic people than in a similarly sized group of non-autistics. Instead of imagining the autistic spectrum like a scale, think of it like a spectrum of colours. All the colours are on the spectrum, regardless of where they appear in the rainbow, but they can look very different to each other. Some colours go well together, while others clash. Some colours blend in, while others stand out. Which colours are most visible depends on the observer and the lighting conditions. Some colours we have words for and you’ll find them in every box of crayons, while some are in-between colours with names like ‘yellowy greenish colour’. The important thing is that, despite being hugely diverse, every one of the colours in this spectrum is as much a colour as any other. Now we’re talking about colours, perhaps your mental image of the autistic spectrum looks like the spectrum of visible colours, but maybe, rather than labels like ‘Red’, ‘Yellow’ etc, perhaps you’ve labelled them with diagnostic terms like ‘Asperger Syndrome’, ‘Kanner Autism’, ‘High Functioning Autism’ etc. However, these types of separate, defined diagnostic terms aren’t actually all that useful because they suggest stereotypical patterns of behaviour and both similarities and distinctions between arbitrary groupings that aren’t really there. In practice they’ve been found to make it harder to recognise autism in many individuals, and to do useful research about the spectrum. Because of this they’re being phased out, replaced with either ‘Autism’ (as is more common in the UK) or ‘Autism Spectrum Disorder’ aka ASD (as is already the single label in America). Maybe when you think of your idea of the autistic spectrum you place people on it in different positions in the order that you consider to be most ‘severe’ or most in need of support, or perhaps to correspond with how visible and detectable their autism is. But the other important thing to remember is that there isn’t any one factor in autism – it’s not a single trait of ‘autisticness’ but a collection of different traits that affect different people in different ways. Yes, it’s possible to rank people in terms of who is most visibly autistic (by some standard) or who currently needs the most support to function in society (by some standard). And yes, there are sometimes practical reasons to want to do this when budgets are tight and services are being rationed to only those who need them the most. However, it’s important to remember that any two people who are very ‘visibly autistic’ may be autistic in very different ways, and that a grouping of the most ‘visibly autistic’ and a grouping of the most in need of support and services won’t necessarily be all the same people. Some people who you consider to look very autistic might be better equipped to succeed or cope in some situations compared some other autistic people who you perceive to be much ‘less autistic’. Perhaps a better metaphor for the autistic spectrum is a colour wheel with every possible colour available in a circular space. 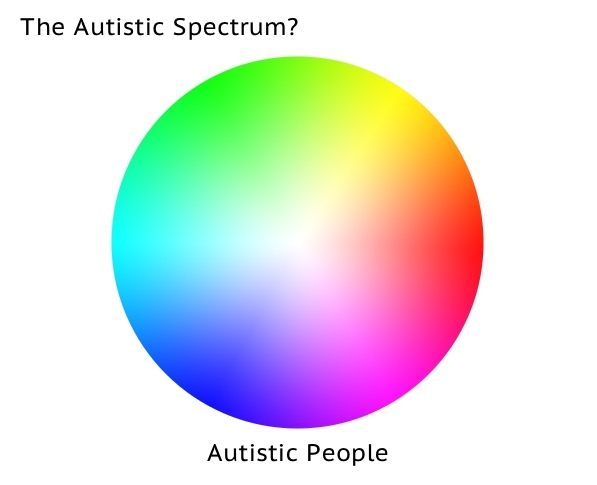 The only label this spectrum needs is ‘Autistic Spectrum’ or ‘Autistic People’, as everyone on the spectrum is an autistic person. But without labels or a scale, how do we understand what any one ‘colour’ on this spectrum means? Perhaps then an even better way to imagine the autistic spectrum, is not just a set of colours or ‘types of autism’ but also all the different autistic traits that make up how any one person experiences autism. Maybe that circle of colours is like a colour picker with several different sliders under it, each of which can be used to control one aspect that makes up the colour selected. No one slider on the colour picker explains the spectrum above it. The only way to fit that diverse and complex circular colour space into a linear scale is to break it down into lots of individual traits, each with their own slider. Together the interactions of all the sliders combine to produce a unique colour, and similarly all the different traits of autism combine together in different ways to create all the diversity within the autistic spectrum. Perhaps the sliders represent the traditional ‘triad of impairments’ and the traits within that. Perhaps they represent the person’s competencies when handling different areas, such as social, sensory, verbal, nonverbal and emotional demands. Some people may have strengths in some areas and difficulties with others. Some people may be severely impaired by some demands, but competent in others. Looking at traits this way may seem like an apparently contradictory mixture of strengths and weaknesses, but this unevenness is part of the nature of autism. Of course this metaphor still isn’t complicated enough, because there are a lot more traits that define and affect autism than there are sliders on a colour picker. There’s also the factor of how people may learn to mask certain traits by developing coping strategies (perhaps we need an alpha transparency slider?) and how traits may change with time and by situation (gradients? intersection rules?). However, unlike a linear scale or a limited set of labels and stereotypes, this is a much better foundation to build your understanding of autism from. It shows how varying traits (that can be at different extremes or anywhere in between) combine together to produce something unique within a wide range of diverse experience, all of which falls inside the autistic spectrum. It invites you to understand that there are differences and oh so much diversity, before moving on to the commonalities. Autism is a spectrum, remember that. I like the analogy to colour a lot, i think it helps clarify a complicated topic, thx for this post. I came up with the analogy while trying to explain my place on the spectrum to people who had a pretty limited idea of what autism looked like and expected that to range only in how verbal an autistic person was. It seemed to be quite successful every time I explained it that way. Then when I repeatedly came across the word ‘spectrum’ being used to justify the idea of everyone having autistic traits or being ‘a bit autistic’ over and over, including once from someone I otherwise respect very much, it seemed like I could use it for some ‘myth busting’. I love the slider bar/color wheel analogy. That’s a great way to help people think about ASD as being made up of multiple elements in vary degrees. Really brilliant! The mix of RGB and CYMK sliders makes me a little anxious but I’m trying not to think about it . . .
Also, thank you for pointing out specifically why “everyone is on the spectrum” is a ridiculous statement. Not they’re not!!! Argh. At first I thought people were using “everyone is on the spectrum” like they use “everyone is a little bit autistic” (again, no) but the way you laid out here helped me grasp that they might also be seeing the spectrum as something that runs from not at all autistic to . . IDK super!autistic? This will make it much easier to answer that assertion without getting into distracting arguments about degree of severity of traits, etc. Although it isn’t meant to be a 1-to-1 analogy, I do prefer it with both RGB and CYMK present, because otherwise it’s possible to make a colour with only one slider moved from 0, defeating the point of the analogy, while with both scales present moving any one slider means at least two other sliders also move from 0, so it’s always a combination of traits. I think we’ve talked before about how it seems that when you research any one trait there are always theories implying that it causes or at least affects the others, so it amused me how apt that actually was (although it wouldn’t be such a direct relationship, of course). This was by far the shortest (and least illustrated) version of this article I’ve drafted/scripted. One previous draft goes into exhaustive detail about how the different sliders might map onto different traits or different ways of looking at autism, but ultimately I decided that this streamlined version without labelled sliders and with a ‘autism isn’t really about colours!’ disclaimer in the caption was much more effective. This is really just introducing the idea that there’s diversity and lots of traits involved. Actually going into specifics makes it harder to take that in. I was a bit sad about losing my extended analogy with the electromagnetic spectrum from a pervious draft. There was a good bit about how as our diagnostic instruments improve in accuracy the visible spectrum widened to include violet and darker red and how perhaps with time more fringes of ultraviolet and infrared will be included (with speculation about what those might be). But again, it was all very clever but not actually making the single point the analogy was meant to be making (and again, I implied all this in a caption instead). Thinking the analogy through to the extremes helped me to make better diagrams, a tighter analogy and to address potential weaknesses in a concise way, I think. It’s really knowing what to leave out and what to keep in that’s the key – being an editor as well as being a writer. Ironically I took so long to finish the original drafts that I became ‘distant’ enough from the idea to treat it as someone else’s work, and so ‘collaborate’ with myself. I’m now thinking I should stockpile imperfect draft ideas as I come up with them so I can develop the good ones at some point down the line. Although I do also want to keep momentum and get a new post out for Friday. Hi, thanks for the main post above, interesting food for thought. I think publishing it in te current shorter form was the right way to go. thoughts can be expanded upon in later posts, but if you loose people with an over lengthy and convoluted post, then they’ve gone. I look forward to reading more. Thanks, I’m definitely learning what to edit out and what’s worth keeping in to make an impactful well structured post. It’s not something I do naturally. Oooh! Can you please also post the longer one at some point! I love really long analogies! And labelled things! Unfortunately it would take a lot of work because about half of it is descriptions of illustrations that I’m yet to draw. Maybe I’ll come back to it at some point in the future though. Oh that makes sense, then. After a little thought I realized this maps onto my own understanding of the spectrum as being multidimensional, each dimension being orthogonal to the others and representing a different facet of autism, so where anybody lies is represented by a vector. Thank you for framing this is a visual way – it really makes it easier to explain to others. The idea of multiple facets combining to make an individual is something I’ve been thinking about a lot recently with regards to sexuality. The color space analogy is a nice one. This post has made me realise that I was still thinking about autism as a linear spectrum with discrete labels, but the multi-trait view makes a lot more sense. I think it’s probably applicable in most situations where we currently think of linear spectrums. Thank you for prodding me in that direction with autism. Glad i’ve given you a useful analogy and helped mudge you out of the labelled linear spectrum model! Hmmm, I’ve been thinking about this and I have more thoughts. What would you classify, then, various people in my (extended) family, though. Because there’s a lot of us, and they range from me, who is autistic, to some people who are very clearly not. But as a whole, there are a LOT of autistic traits in my family (and probably several more autistic people besides me), but I also feel like in my family, I could probably line people up from mostly neurotypical to mostly autistic. Because that’s the reason I wasn’t diagnosed until an adult. Because in the context of family and home I was perfectly functional, and seemed just a tiny bit stranger, but not anything significantly more than anyone else. Just some thoughts on wording and stuff. I still think your post is awesome though, and agree with it. I just thought of more complications/people/things and am wondering what you would think about it. That’s a really good point and something I do want to talk about in great detail on this site eventually. We know that there is definitely a strong genetic component to autistic traits (in at least some cases). There’s also a huge amount of overlap with specific learning differences like dyspraxia, dyslexia, ADHD etc that can manifest on their own without autism. As in, there are traits that often come with autism that aren’t limited to autistic people. There’s reportedly anecdotal evidence that people in certain types of analytical (and perhaps creative) professions are more likely to have autistic children (or at least I’ve read this stated as fact in books and magazine articles by autism professionals). This is sometimes called ‘the wider autistic phenotype’. There’s also evidence that people who have SpLD conditions that overlap with autism are more likely to have autistic kids, and also that siblings of autistic people are more likely to be autistic or have conditions that overlap with autism. Autistic parents are more likely to have autistic children, etc. So while there’s no agreement on (or likelihood of) a single genetic cause, there’s consensus that there is definitely a genetic factor in a lot of cases. In the original longer version of this post, which is alluded to elsewhere in the comment threads, there was a section that went off at length talking about how my linear spectrum model had the brightest visual spectrum colour – yellow light – in the middle as classic autism, then to one side it went towards conditions stereotyped as being more analytical and in the other those stereotyped as having more repetitive behaviours. The idea that i was getting at was that some animals can see parts of the infrared spectrum or ultraviolet light which isn’t visible to us. So by some definitions this is also visual light if you have the capability to see it. I then took a metaphor of the diagnostic criteria and/or our understanding of autism as being like a primitive camera designed to pick up light. Originally it could only pick up the yellow light (classic autism as recognised by Kanner). Then, with more study and real life cases, it was tuned so that the green and orange light on either side could also be picked up (the Asperger’s and PDD-NOS cases that were closest to the stereotypes/needed most support, and people who started out as classic autism but grew up to fit a different profile). Right now, decades later, our understanding is good enough that we have the entire visual spectrum, but some people around the fringes appear so dark to the camera that they can be mistaken as not being there (women who present differently, PDD-NOS people who don’t quite fit the criteria even though they struggle just as much, etc). Perhaps as our understanding grows of coping strategies, atypical presentations and what the very common overlaps with SpLDs mean, then more of what’s currently classed as ‘infrared’ or ‘ultraviolet’ will be ‘picked up on the camera’ and recognised as actually being autism. Beyond that though, the pure infrared and ultraviolet (which might be things like SpLDs that really aren’t autism but are definitely neurodivergent, and people who have analytical minds and fit the ‘wider phenotype’ but really aren’t autistic) is a part of the electromagnetic spectrum that is closest to and similar in some ways to the visual/autistic spectrum part, but isn’t ‘on the visual spectrum’. It’s on a wider spectrum of neurodivergence which is on an even wider spectrum of all electromagnetic emanations. I liked this metaphor because it did actually include all people – the entire range of the electromagnetic spectrum. Within which visual light – the autistic part – is only a tiny amount 1 or 2%. The wider autistic phenotype part and the SpLD part is much much wider, probably accounting for 10% or more each (of course in reality there’s a lot of overlap – it isn’t really linear, there are lots of overlapping interacting scales!). Then there’s something like the remaining 80% or more of people who aren’t on the autistic (visual) spectrum at all or even close to it, although they might be nearer to some ‘ends’ of the wider neurodiversity spectrum (but again, not really linear!). If I had kept this in then the colour wheel image would’ve also faded to black around all the edges. Ultimately I almost completely left these ideas out of the finished post because I wanted to keep it as simple as possible and get across only two or three core ideas in a very clear way. I didn’t want to talk about the overlaps with autism and other things, and I didn’t want to be over specific about what autism is or isn’t and what might cause it. These are important things that I want to address later (some of them in great detail), but this was meant to be a starting point. I also felt that if I did a diagram that implied SpLDs were on the far end of a linear scale to Asperger’s then some people would take that literally, which would be the very last thing I would want anyone to do given that all these things overlap each other greatly. It is far more the colour wheel than the linear scale, so I didn’t want to go off on a digression that encouraged people to develop ideas that contradicted that. I may still revisit this visual metaphor to talk about the ‘fringes’ of the spectrum, diagnostic criteria, where the spectrum sits within overlapping neurodevelopmental conditions the wider spectrum of all people etc, but when I do that I’ll need to take a lot of care and make sure that I’ve talked enough about autistic traits first. 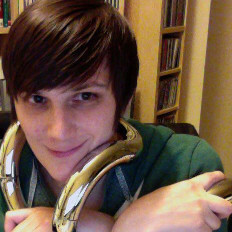 Anyway, I hope that (probably far too long!) reply has explained more about how people who aren’t autistic can have a lot in common with people who are, and how these traits can combine in non-autistic parents to produce autistic offspring. I’m sure some people would compellingly argue that there are also ‘nurture’ factors involved, especially around developing coping strategies. I know I always feel hugely normal around my family compared to most of the rest of the world. Hi Kellie, I just want to be clear that I’m not trying to explain what autism is in this post, I’m explaining the concept of a spectrum condition through the use of a visual metaphor that isn’t supposed to be taken literally. It’s now widely accepted that autism is a spectrum condition and that the previous individual labels were not useful for either research or practical use with individuals. This is reflected in current research and the new DSM-5 Autism Spectrum Disorder criteria along with the removal of Autistic Disorder, Asperger Disorder, PDD-NOS etc. Researchers like Wing and Gould who originally coined ideas like the triad of impairments, have been talking about autism as a spectrum for decades, and stressing the diversity under that spectrum. How there were separate presentations like ‘aloof’, ‘passive’ and ‘active but odd’, how there was a triad of impairments that could combine together and present in very different ways. Really all I was trying to get across was that autism is a label that covers a huge amount of diversity, and that it isn’t a linear scale but a combination of numerous different traits that when taken together are used to diagnose autism, and to understand any one autistic individual. Because autism is so complex and diverse, it’s important to understand each person as an individual with their own challenges and strengths, rather than enforce a ‘one size fits all’ label on them. I wasn’t really even trying to talk about what those traits are, or what the cause or causes might be (I’ll probably do posts later illustrating the theories of various researches, but only if I think they give a useful practical perspective for thinking about autism). Anything will be a simplification, even the diagnostic criteria are simplifications and complications. I was really just giving people a better starting point to think about the spectrum from, rather than a linear scale of ‘not autistic’ to ‘totally autistic’. It’s a nice metaphor to help people think about it the right way, but it doesn’t really help anyone talk about it any easier. In fact, I’d say it actually makes it more difficult to talk about than the current (though of course not quite right or else there wouldn’t be this article) standards people use. Autistic spectrum logo. August is Autistic Spectrum Month. Make my profile picture, yours, during August. This is the emblem, symbol, or logo, for AS, Aspie, and Autistic Spectrum. We try to put pieces of different information together to reason out a puzzle. This is represented by the color pieces, and how they are different, but still fit in together to solve the pie chart. These ASPIE PIE PIEces, because of their differences, create a peace sign. AS PIEces of a PIE, all of these PIEces of information fit in together. We strive to get along with others who operate differently. Understanding and tolerating each-others differences, are AS PIEces of a PIE, fitting together in PEACE. Notice that that the name ASpie is incorporated into the phrase “AS PIEces”. Piece and peace are Homophones. Many hyperlexic ASpies love letter & word play. Aspies are intellectually and emotionally different. It is a challenge to live in a world of NTs (neurotypical). This is represented by the A and S dots for eyes, and a horizontal line for our expression. It represents an ASpie face. We are busy analyzing both emotions and data. Our eyes or expressions may not be what you typically expect, or are not spontaneous. We may not even make eye contact. You may not “read” our eyes correctly. ASpies make valuable contributions to society if we all come together. We can all fit in to make a pie in peace, and each share a piece of it. I have designed this replacement. If you save this picture as your profile picture, only the A.S. (Aspie) symbol will show. You can left, and then right click to save it. Otherwise, you may use it as your header with no time limt. It will show your acceptance of Aspergers Syndrome and Autistic Spectrum. This emblem of united pieces is by and for us Aspies. You need not just be BLUE or gold. You can show a spectrum of colors by displaying our spectrum emblem. We are not just a puzzle PIECE, and are not missing anything. We do fit in, and we can SPEAK for ourselves! Let us support ourselves, rather than an NT jigsaw organization that is profiting from pitying us. We are all individuals, and need not have the same letters in our name. Show support for us by proudly displaying our logo.